The Trump administration wants to kick America’s deportation machine into high gear – but there have been important shows of resistance to build on, writes Danny Katch for US website SocialistWorker.org. The Department of Homeland Security (DHS) released two memos on February 20 laying out measures to implement Donald Trump’s anti-immigrant executive order, issued under the misleading title “Enhancing Public Safety in the Interior of the United States”. In reality, Trump’s order is a clear-and-present threat to the safety of millions of people, undocumented and not – and DHS officials have drawn up a battle plan for carrying it out. The DHS memos are chilling because of the directives they contain that could destroy the lives of so many people – but also for their language that directly imports the racist right wing myth of immigrants as a menacing horde directly into official government policy. “Criminal aliens have demonstrated their disregard for the rule of law and pose a threat to persons residing in the United States”, one memo declares, as if it was cut-and-pasted directly from a rant at Breitbart News. The new guidelines call for an expansion of deportation priorities for Immigration and Customs Enforcement (ICE) that could include any number of people among the undocumented: people convicted of crimes, no matter how minor; others who haven’t been convicted, but merely charged; and still others who ICE itself determines have committed a crime, regardless of whether they’ve even been charged. Included on the list are any people who have “engaged in fraud or wilful misrepresentation” related to any government matter (which could mean using a false ID, as many undocumented people do to get work), who “have abused any program related to receipt of public benefits” and who an ICE agent deems to be a “risk to public safety or national security”. – Drastically expanding the powers of ICE agents to use “expedited removals”, which allow for quick deportations without a legal hearing. Until now, expedited removals could only apply to immigrants who are found within 100 miles of a border and who have been in the country for fewer than two weeks. Now, the policy can be used against immigrants anywhere in the US who have been in the country for up to two years. – Restoring the 287(g) program that deputises police officers to work as deportation agents inside local jails. – Hiring 10,000 more ICE officers and 5,000 more Border Patrol agents. – Increasing penalties for undocumented parents in the US who are caught trying to bring their children into the country. – Publicising crimes committed (or allegedly committed) by undocumented immigrants. Trump spokesperson Sean Spicer claimed that the new measures merely “take the shackles” off agents working for ICE and the Border Control so that they can properly enforce existing laws and policies. But any talk of reverence for the law is a joke coming from an administration led by a serial tax cheat and sexual assaulter. In fact, the Trump administration is aiming to free its agents from having to follow the cornerstone of the law, known as “due process”, which requires legal hearings and representations. The new regime wants to further empower members of the two federal agencies who the strongest supporters of Trump’s racist and xenophobic presidential campaign – and his promise to be judge, jury and destroyer of families for millions of immigrants. The week before the DHS memos were released, there were a number of stories illustrating the warped sense of justice among the very agents who will be given more draconian powers. In Seattle, immigration officers detained Daniel Ramirez Medina, who has legal status as a recipient of the Deferred Action for Childhood Arrivals (DACA) program covering those who came to the US as young people. Ramirez’s detention was justified on the basis of the unproven claim that he’s a “gang member”. In El Paso, Texas, ICE agents arrested Irvin Gonzales, a transgender woman who was leaving a courthouse after filing for a protective order against an abusive partner – the very person who is suspected of having reported her to ICE. And in Virginia, ICE staked out a church hypothermia shelter in order to nab six homeless immigrants on their way out in the morning. It’s impossible to know how many immigrants have risked freezing to death or being beaten by their partner in the past week because news of these arrests kept them from seeking assistance. But there is no contradiction for Trump and his minority base of hard right supporters. They see all immigrants – especially those who aren’t white – as inherently dangerous, violent and criminal. These are the politics characteristic of European far right parties that Trump and his chief strategist Steve Bannon, the former Breitbart boss, are trying to impose from the White House – which could explain Trump’s bizarre reference to a bogus Fox News report claiming that immigrants are causing a crime wave in Sweden. But the idea of mass deportation is deeply unpopular in the US. According to polling conducted by the Public Religion Research Institute during the 2016 election, only 16 percent of people support mass deportations as the main immigration policy – including just 31 percent of those who identify as conservative Republicans – while 64 percent support what is generally known as a “path to citizenship” for most undocumented immigrants. So we’re facing a hard right coup on immigration policy, carried out by a president and a Republican Party trying to claim a mandate that they don’t have. But as millions of immigrants and their supporters figure out how to resist this onslaught, a look at how we got to this point over the last 10 years shows one thing that won’t help: relying on the Democrats. Deportations started to climb after 1996 when Democratic president Bill Clinton wanted to show he could be tough on “illegal aliens” by signing the Illegal Immigration Reform and Immigrant Responsibility Act. They continued to increase under George Bush and a Republican Congress in 2000s, culminating in legislation introduced by Wisconsin representative James Sensenbrenner that would have classified all undocumented immigrants as felons, along with anyone who helped them enter or remain in the country. The Sensenbrenner bill unleashed the sleeping giant of immigrant power in the spring of 2006. There were a series of “mega-marches” that culminated in the May 1 “Day Without Immigrants” actions, which amounted to one of the largest work stoppages in US history. The mega-marches defeated the Sensenbrenner Bill, but the Bush administration responded with even more deportations, along with highly publicised workplace raids designed to cause maximum panic. In the face of this repression, many immigrants and activists turned from protesting to campaigning in 2008 – they supported Barack Obama, the former community organiser who even used the immigrant farmworker slogan “Yes We Can!” as his campaign slogan. Their hopes in Obama were bitterly betrayed. For the first two years of Obama’s presidency, Democrats had control of both houses of Congress, but they didn’t pass any laws to reduce deportations or provide a chance at legalisation and citizenship. Even after Republicans won Congress and blocked any chance at major legislation being passed, Obama could have taken pro-immigrant executive actions in the way that Trump is now. Obama could have pardoned most or all undocumented immigrants, or issued a moratorium on detentions and deportations until Congress came up with legislation. Instead, he increased the pace of deportations – reaching a peak of 434,000 sent across the border in 2013 – while insisting that he didn’t have the legal authority to do anything without Congress. It was only when immigrant students were protesting him in 2011 as he began his re-election campaign that Obama discovered he did have some executive power and created DACA. In his second term, Obama directed ICE to focus more on immigrants with criminal records and recent arrivals near the border – many of whom were refugees not given a chance to plead their case due to Obama’s expanded use of the expedited removal policy that Trump is now expanding even further. 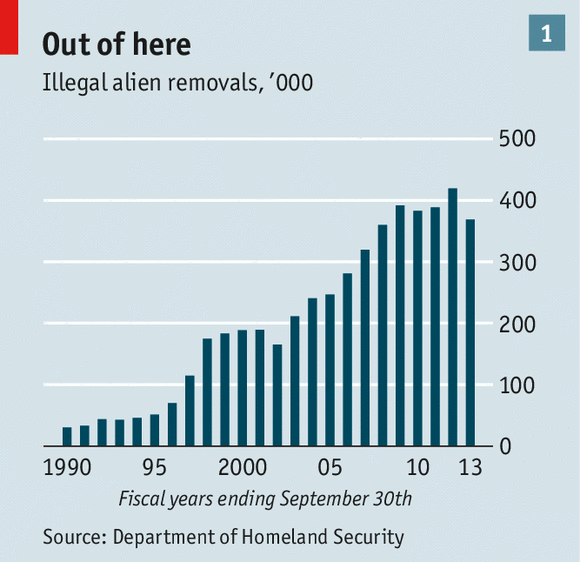 Over the last few years, the number of deportations came down to “only” 333,000 last year. That number is greater than any year before 2008, but, of course, Republicans find it to be scandalously low. But even as Obama was slightly scaling back deportations, he did so using a reactionary – and false – claim that he was only going after “criminal” immigrants. Many liberals accepted this as a good compromise, without asking why people who have already been through the criminal justice system for their crime should also face a second punishment of deportation. Obama called this prioritisation policy “Felons, Not Families”, a gross characterisation of people with criminal records as outcasts without loved ones and dependents. In a country in which racism and mass incarceration have led to one in three people having a criminal record – and even higher rates among Blacks and Latinos – Obama’s dehumanising of “criminal immigrants” laid the groundwork for Trump’s even more reactionary and racist campaign that all immigrants are criminals. Now, Trump is trying to ram through much of the Sensenbrenner Bill as an executive order without even going through a vote of Congress. It’s a fittingly authoritarian way to try to implement what could turn out to be nothing less than a state of war against up to 11 million people living in this country. By making massive policy changes via executive order, it’s unclear what this enforcement will look like. In the face of strong resistance, it’s possible that the Feds could back off some of these plans. That’s what appears to have happened with an idea floated in an early draft of these policies that called for mobilising the National Guard as a deportation force. On the other hand, if the Trump regime is able to drive through these policies despite popular opposition, they can ramp it up even further – perhaps bringing back the National Guard idea, or rescind DACA, which in any case they can get rid of through attrition by not renewing people for the program over the next two years. As if to underscore the cowardly nature of their plans, Trump’s latest immigration atrocity was announced by a faceless bureaucracy – via a DHS press release and a conference call with three DHS officials who requested anonymity. On the call, officials claimed that they aren’t planning mass deportations. They had the nerve to claim that this was “entirely a figment of folk’s imagination” – as if Trump hadn’t said exactly that during the presidential campaign. This is an existential attack on the estimated 11 million people living in the US without documents, the tens of millions more who love them, and everyone else who has in interest in fighting an authoritarian and racist government. “It’s notable that in contrast to the months and weeks of planning it took to accomplish this a decade ago, the February 16 action was organised with just a couple days of preparation. It will also be important to show that there are now millions of non-immigrants who are willing to take to the streets in support of equality – and to build community networks that can respond to ICE raids and pressure local politicians not to collaborate with the modern day slave catchers invading our cities. Around the country, millions of people want to show their resistance to Trump – it’s crucial that they understand the old labour movement slogan: An injury to one is an injury to all. While we’re building this resistance to Trump’s onslaught, socialists should be arguing for our movement to abandon a decade of rotten compromises put forward by political leaders – and demand nothing less than full citizenship and equality for all current and future immigrants.